Installation 01, also known as Beta Halo, is one of the seven ring-shaped superweapons that comprise the Forerunners' Halo Array. One of two Halos located in the Orion Arm (the other being Installation 04), Installation 01 is the farthest Halo from Installation 00. It features a limited atmosphere and a desert-like landscape. 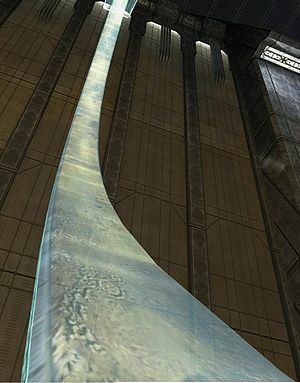 The Forerunners had Installation 01 constructed by the Foundry of Installation 00 approximately around the same time as the rest of the Halo Array, circa 97,445 BCE during the Forerunner-Flood war. The array was designed by the Forerunner Builders to combat the parasitic Flood by eradicating them and all sentient life in the Milky Way. After the rings were built, Installation 01 and its fellow Halos were distributed from Installation 00 to positions across the galaxy through slipstream space portals, with Installation 01 being positioned the furthest from the Ark. Afterwards, the Halo Array was fired and eradicated all sentient life from the galaxy. The Forerunners proceeded to reseed the galaxy with life from the species that were preserved on the Halo installations. Like its fellow installations, Installation 01 became home to dormant specimens of the Flood that were intended to be used to help find a cure to the parasite in the future. With the Flood defeated, the surviving Forerunners exiled themselves from the galaxy. On November 3, 2552, during the Battle of Installation 05, Chieftain Tartarus of the Covenant activated Installation 05, though United Nations Space Command and Sangheili forces managed to terminate the firing sequence before the Halo could fire. As per fail-safe protocol in the event of an unexpected shutdown, a signal was sent to Installation 01 and the rest of the Halos from Installation 05, placing all Halos of the array on standby mode, ready for remote activation from Installation 00. A readout from Installation 05's control room showed that Installation 01 was fully prepared to fire on demand. However, during the Battle of Installation 00 on December 11, 2552, the UNSC and allied Sangheili forces fought to prevent the Covenant from firing the Halo Array from the Ark, as Installation 01 and its fellow Halos were still in standby mode and was prepared to receive the signal to fire. Eventually, Master Chief Petty Officer John-117 succeeded in deactivating Installation 01, as well as the rest of the array, before it could be fired. Like its fellow ring installations of the Halo Array, Installation 01 is approximately 10,000 kilometers (6,200 miles) in diameter and has a surface width of 318 kilometers (198 miles). Perhaps due to its primary designation within the array, Installation 01 was designed by the Forerunner Builders with a very simple environment in mind. Instead of the verdant landscapes seen on most of the other rings, Installation 01's environment is comprised of a large desert with a limited atmosphere; this may have been by design, due to a lack of proper maintenance or some other incident after the original firing of the Halo Array. The farthest Halo from Installation 00, the Halo was capable of wiping out all sentient life in a 25,000 light-year range, along with its fellow Halo installations.